With Africa’s rich combination of tradition and modernity continuing to enrich global culture, Media 10 is delighted to announce the third edition of Design Joburg Featuring Rooms on View. 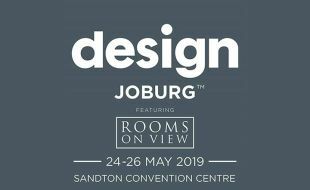 Gauteng’s premier, contemporary and decorative design show has quickly established itself as the continent’s leading annual décor and design event, taking place from 24 – 26 May 2019 within the heart of Sandton. Media 10 will once again bring a stellar number of the best design brands under one roof, combining the local and global pioneers and trailblazers of the design world. The 2019 show will be tailored under the curative eye of one of the continent’s most iconic design duo’s Philippe van der Merwe and Greg Gamble from retail atelier and design studio Tonic Design. Tickets can bought from Webtickets or at the door.